Trucking requires full concentration on the road. Not only must commercial drivers contend with other motorists, dangerous weather conditions, and wandering wildlife, but they must do so while operating large rigs, often carrying heavy and sometimes dangerous cargo. One mistake carries possible huge repercussions. Do not tailgate. Be patient. Maintain proper space with the vehicle in front of you. According to studies, the most common vehicle trucks hit is the one in front of them, due to tailgating. The bigger the rig the longer it takes to brake and stop. Signal early when approaching an intersection, giving other motorists ample warning of your intended direction. With so many blind spots on a truck, minimize lane changing. Check your side mirrors at least once every 10 seconds. Use the truck's flashers when driving below the posted speed limit for an extended period of time. Give your truck ample time and space when slowing down for a complete stop. Use brake lights early. 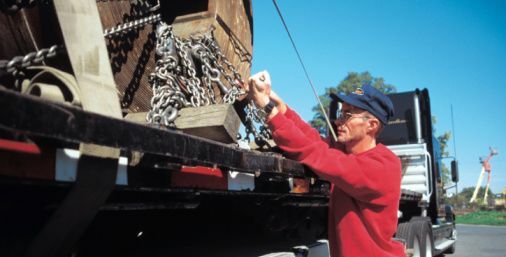 Most motorists don't realize how long it takes for a rig to stop. If you must idle the truck, keep windows closed to avoid prolonged exposure to fumes. Avoid idling while sleeping, loading, or unloading. When pulled off to the side of a road, highway, or Interstate due to mechanical problems, always use flashers, reflective triangles, and even road flares to alert approaching drivers. Always have tire chains at the ready, especially when driving in mountainous regions. Try to maintain a full fuel tank in winter driving to prevent water condensation from building in the fuel lines. Maintain additional space with the vehicles in front of you when driving in rain or snow. Operate below the posted speed limit when driving in wintery conditions. Exercise caution when approaching bridges in wintertime. Bridges freeze faster than roads, creating difficult to detect black ice. Slow down in work zones. Close to one-third of all fatal work zone crashes involve large rigs. Plus, you could lose your commercial drivers license if caught speeding in a posted work zone. Take plenty of driving breaks, especially while driving cross-country, to help remain alert. Don't fight eye-fatigue. Pull off the road and take a nap. The consequences of falling asleep at the wheel, far outweigh those associated with arriving late. Strictly adhere to commercial driver hour restrictions. By law you cannot exceed 11 continuous hours of driving. You could jeopardize your truck driver career if caught violating this law. For additional safety driving tips, consult your state's CDL manual. You can grab one from any Department of Motor Vehicles (DMV) office, or download a copy from your DMV's website. Did we miss anything? Share your wisdom with our online community by leaving your comment below.